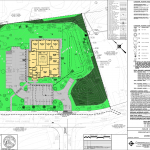 Our Work – Commonwealth Engineers, Inc.
Commonwealth Engineers, Inc., was responsible for the preparation of an eighty (80) acre industrial park which currently includes Keystone Foods, a 200,000 square foot regional distribution center for McDonald’s restaurants, a National Guard readiness center, and a mixed use office/warehouse building. 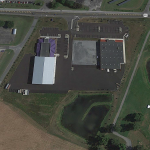 As part of the project, we worked with PA American Water Company and the Pennsylvania Department of Environmental Protected to expand the Coatesville Wastewater Treatment Plant, allowing the project to proceed to completion. 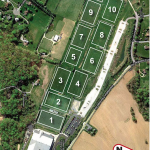 We also worked with the Federal Aviation Administration (FAA) to comply with Federal standards applying to the adjacent Chester County Airport. 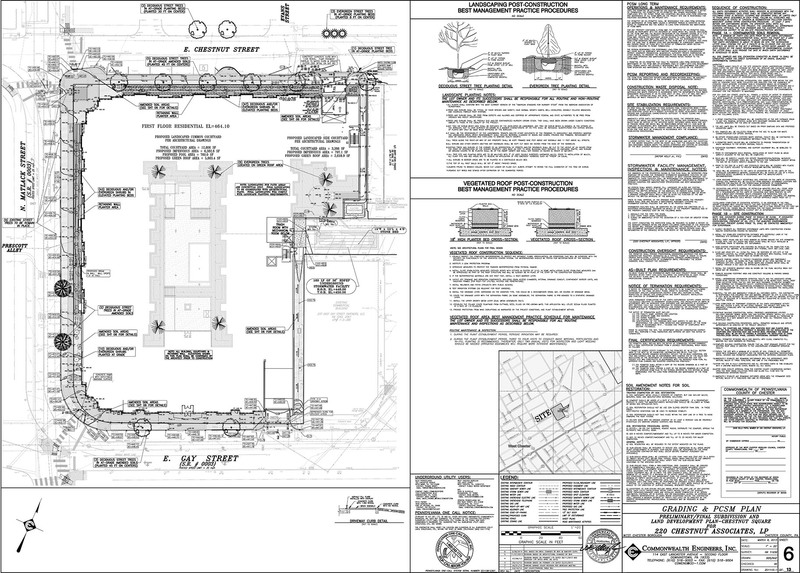 Commonwealth Engineers successfully secured all required Local, County, and State permitting. 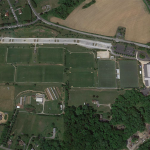 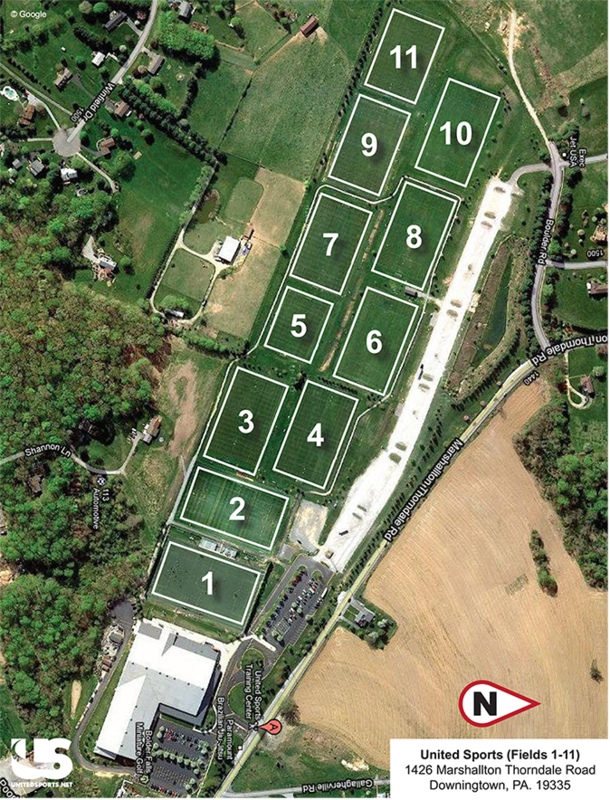 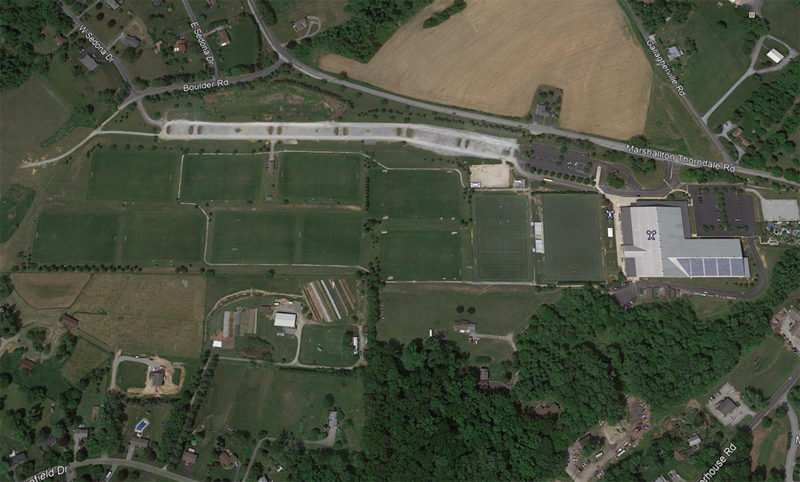 Commonwealth Engineers, Inc. was responsible for the preparation of the Land Development Plans for the United Sports Training Center (USTC) project which consisted of sixty (60) acres with eleven (11) outdoor athletic fields, a 125,000 square foot indoor sports complex, 660 parking stalls, walking trails, pavilions, outdoor volleyball, concession stands, and all appurtenant utilities. 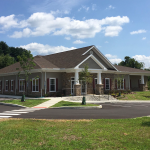 Commonwealth Engineers was involved from the feasibility stage through the approval process and with the construction phase of the project, and successfully secured all required Local and State Permitting. 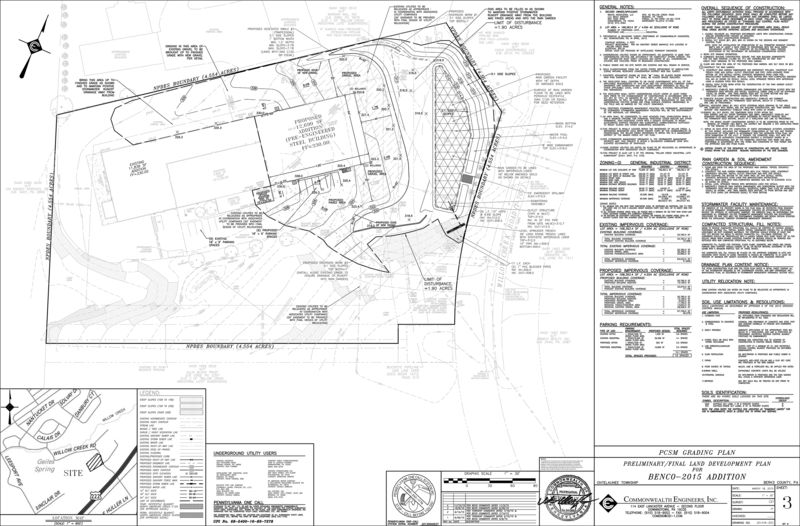 Commonwealth Engineers, Inc. performed all comprehensive engineering services for The Traymore Tract, a 26-acre parcel in Rose Valley Borough, Delaware County, Pennsylvania. 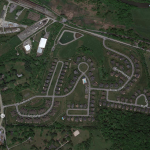 Traymore consisted of a luxury townhouse development with several new roadways and protected open space. 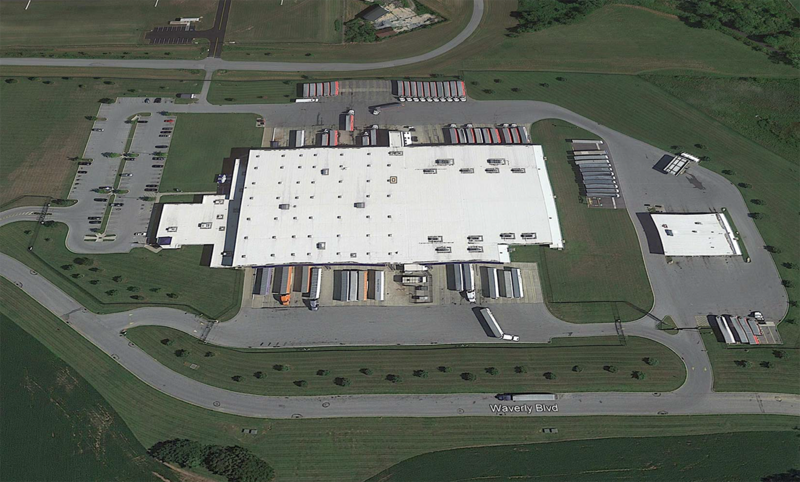 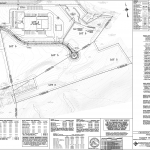 Commonwealth Engineers was able to successfully secure all required Local and State Permitting for this site. 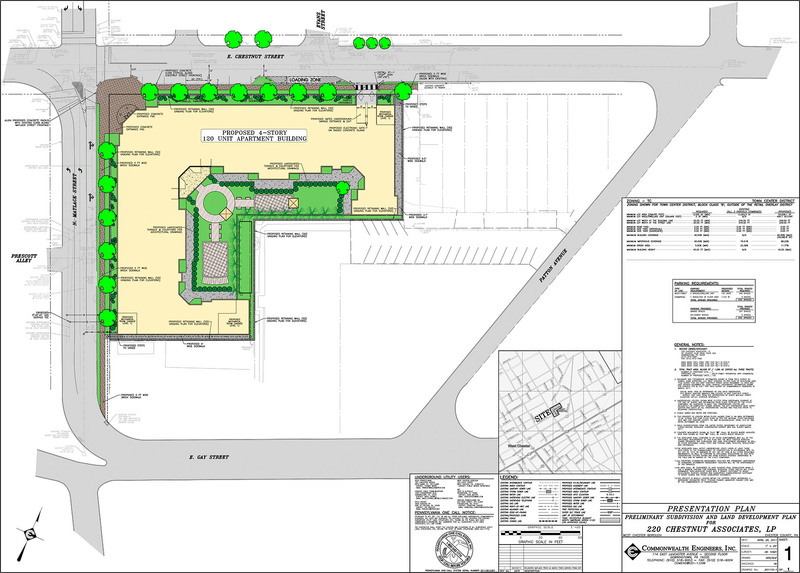 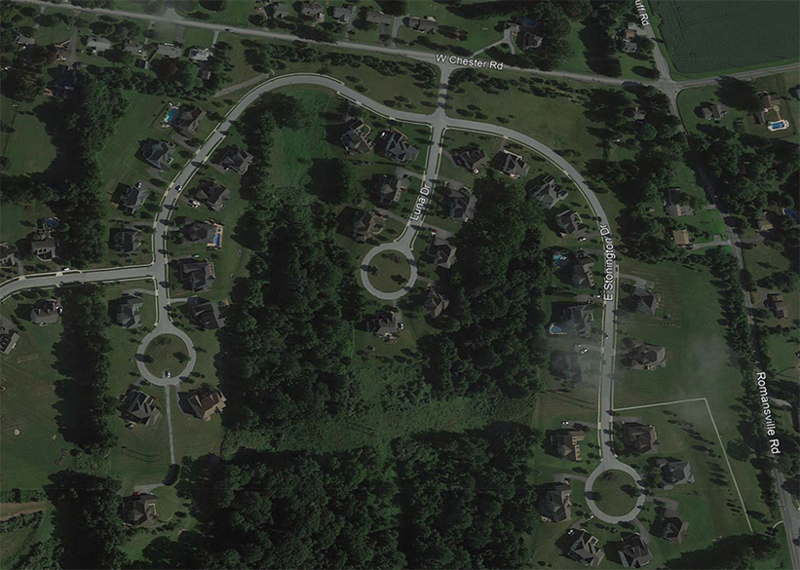 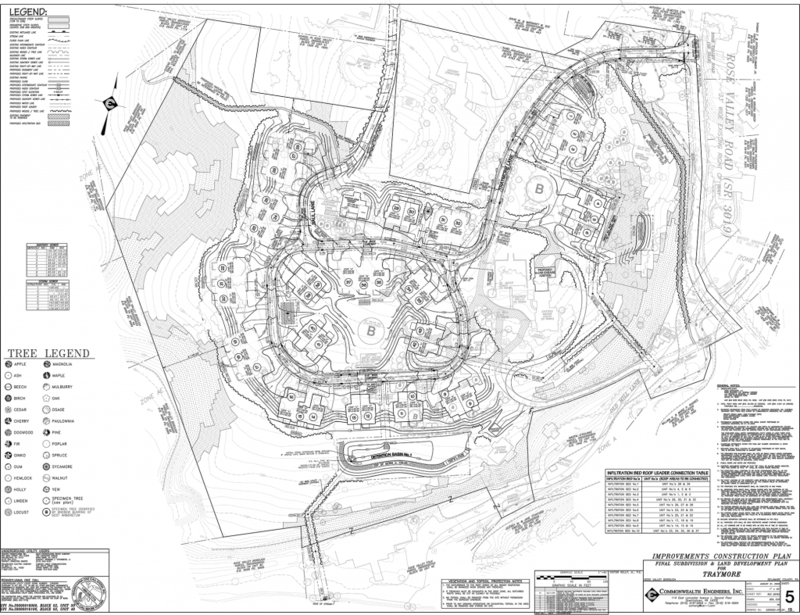 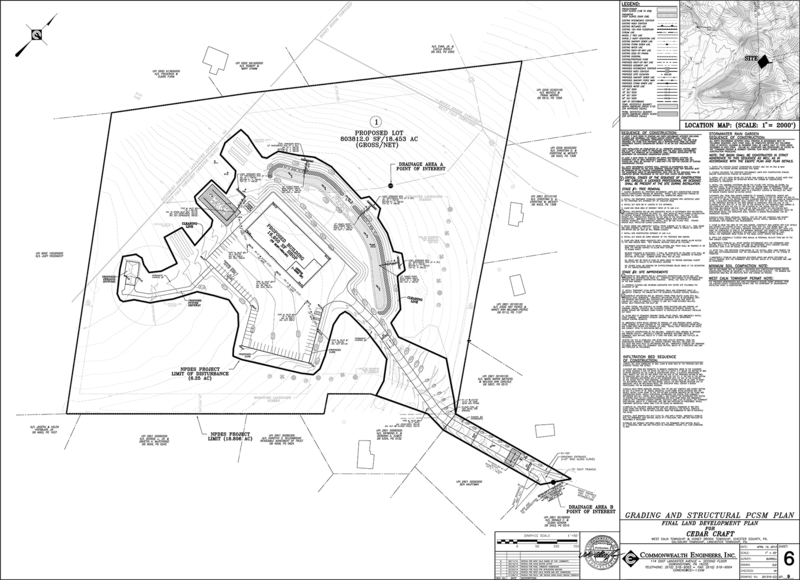 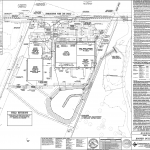 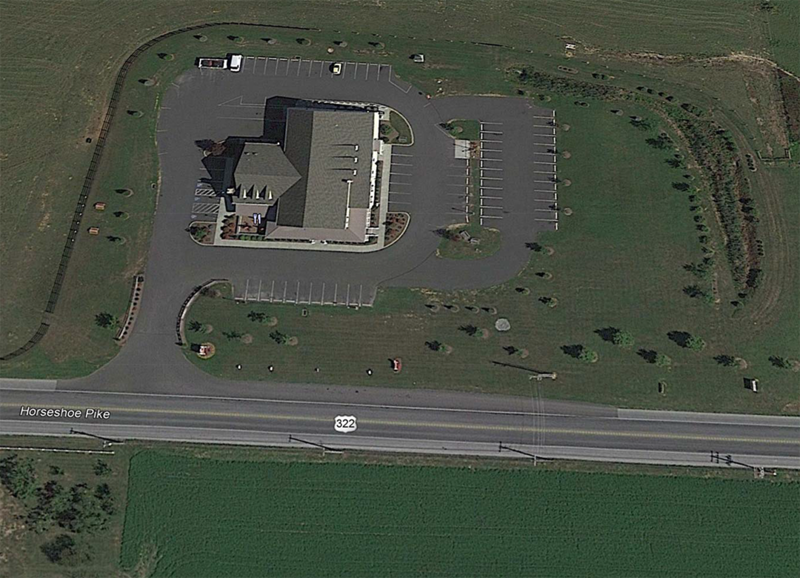 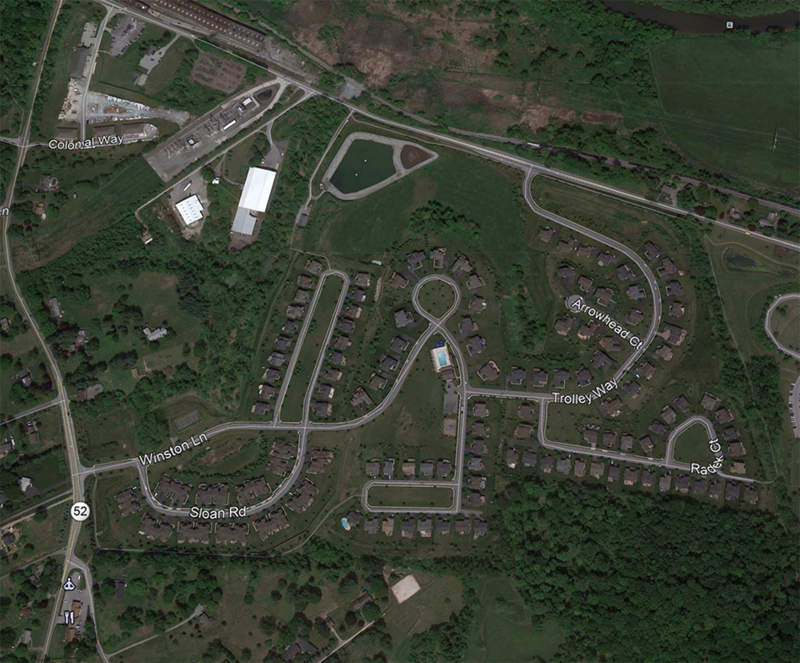 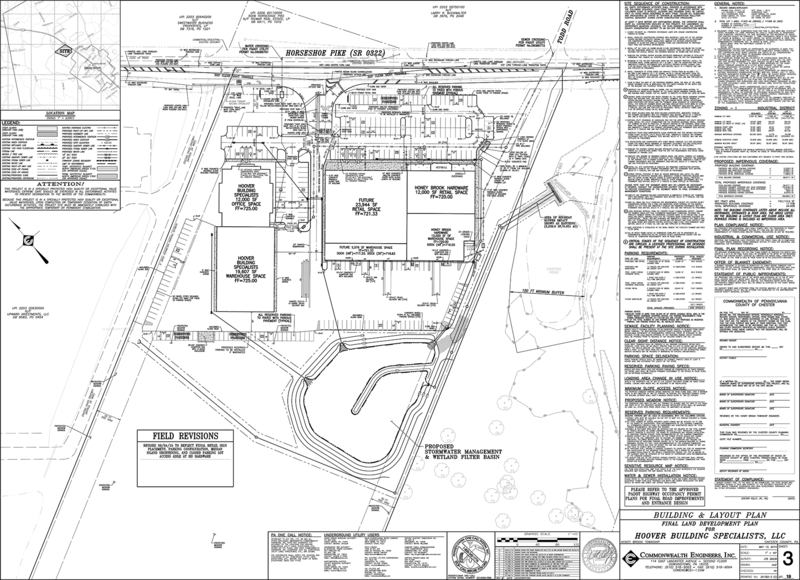 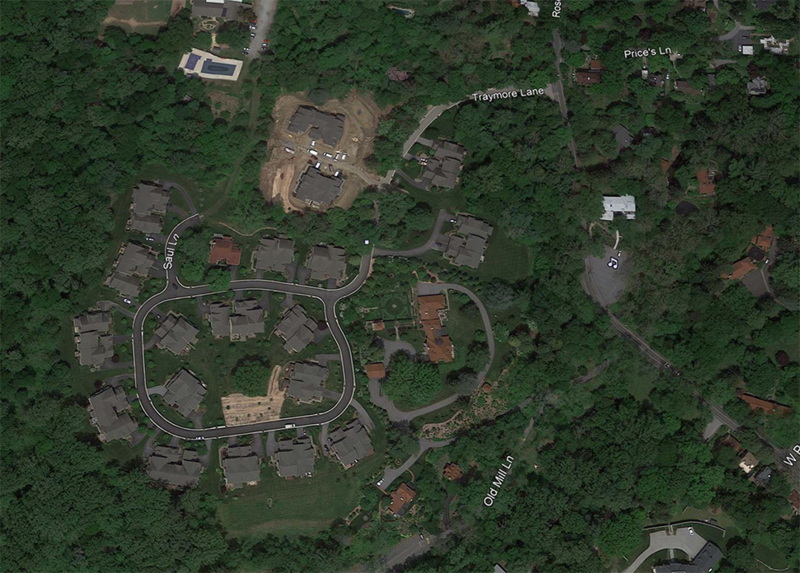 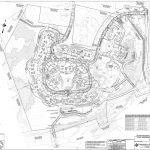 Commonwealth Engineers, Inc., was responsible for the preparation of numerous Subdivision and Land Development Plans for Toll Brothers, including the Sheeder Tract, which included 150 units in a mixed carriage house/townhouse development with protected open space on 138 acres in Pocopson Township, Chester County, Pennsylvania. 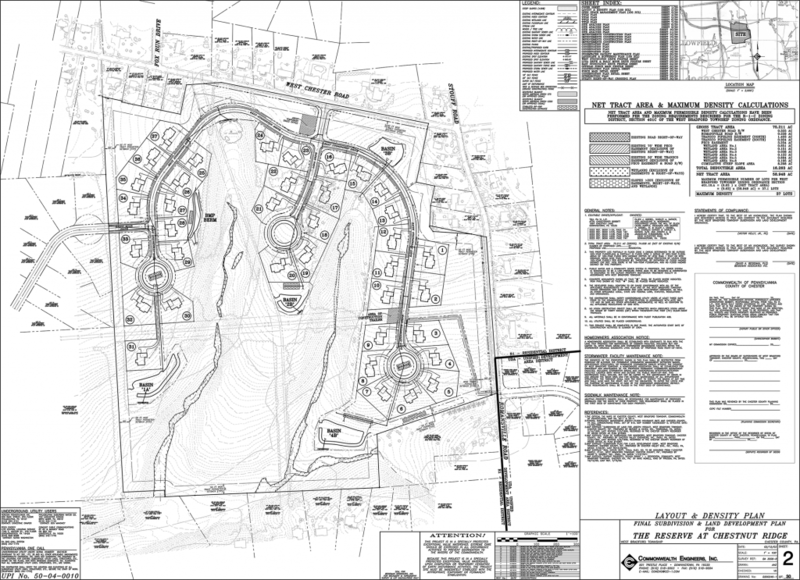 Commonwealth Engineers successfully secured all required Local, County, and State permitting. 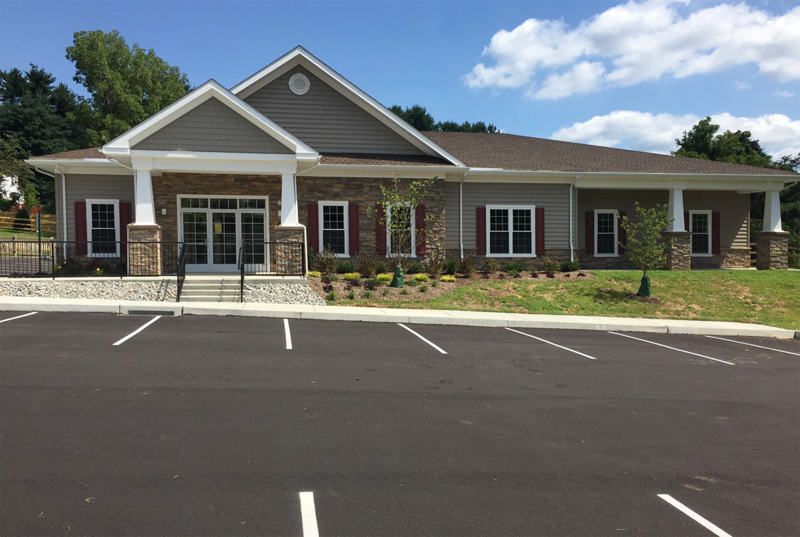 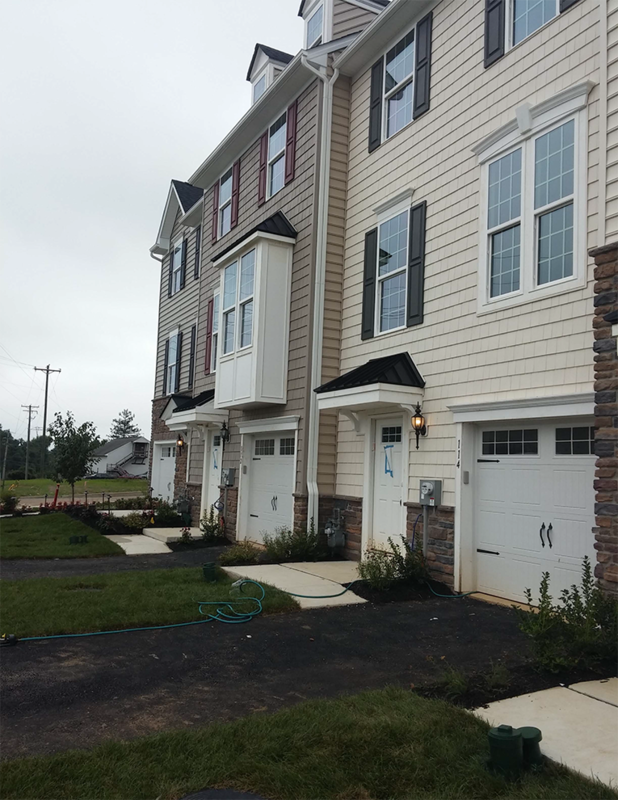 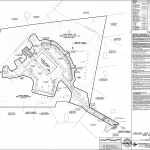 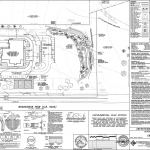 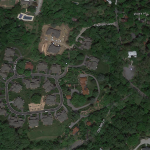 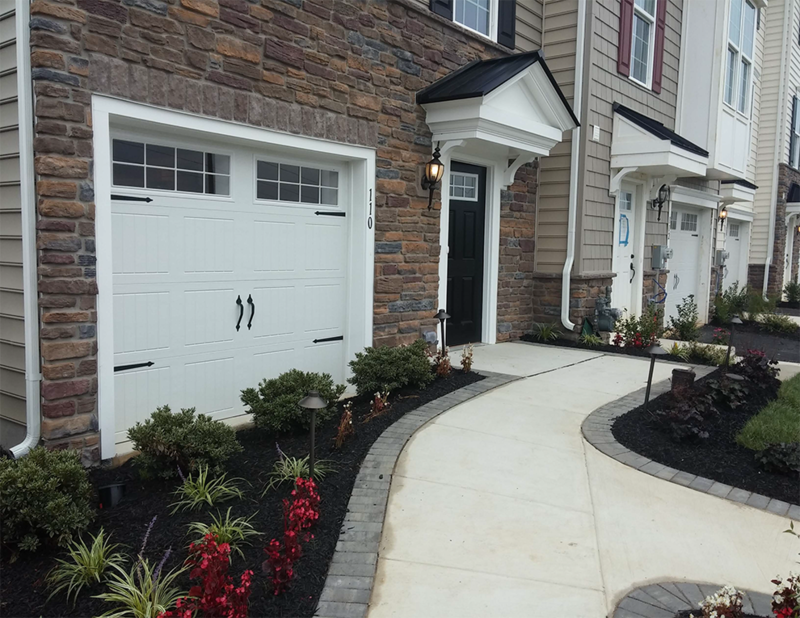 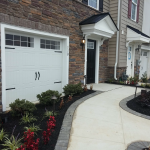 Commonwealth Engineers, Inc., recently completed a two-phase design of a townhouse development in East Whiteland Township that will ultimately consist of 115 townhouse units. 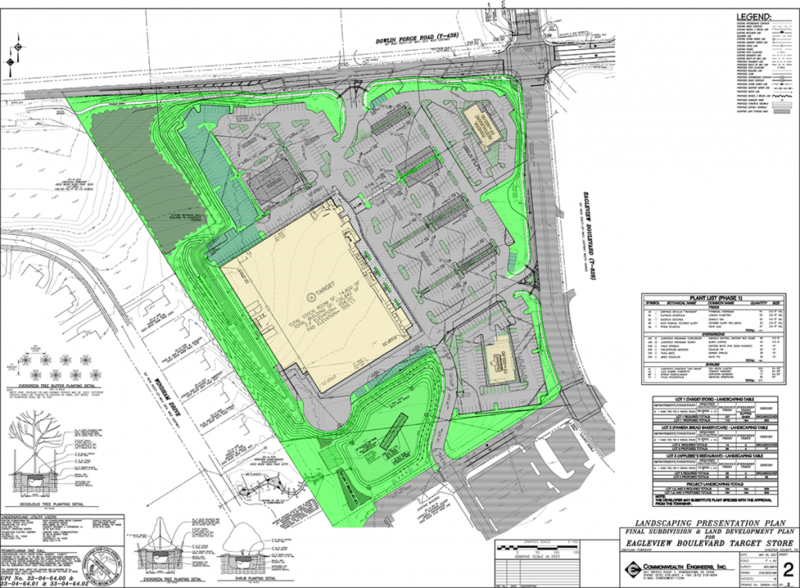 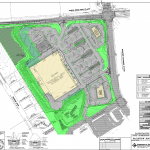 The project required Conditional Use approval from the Township. 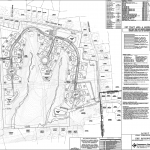 In addition, the project is located in a specially protected Exceptional Value watershed and required impacts to floodplains, stream channels, and riparian buffers. 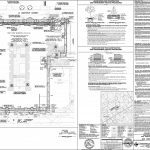 Commonwealth Engineers successfully secured all required Local, County, State, and Federal permitting. 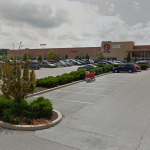 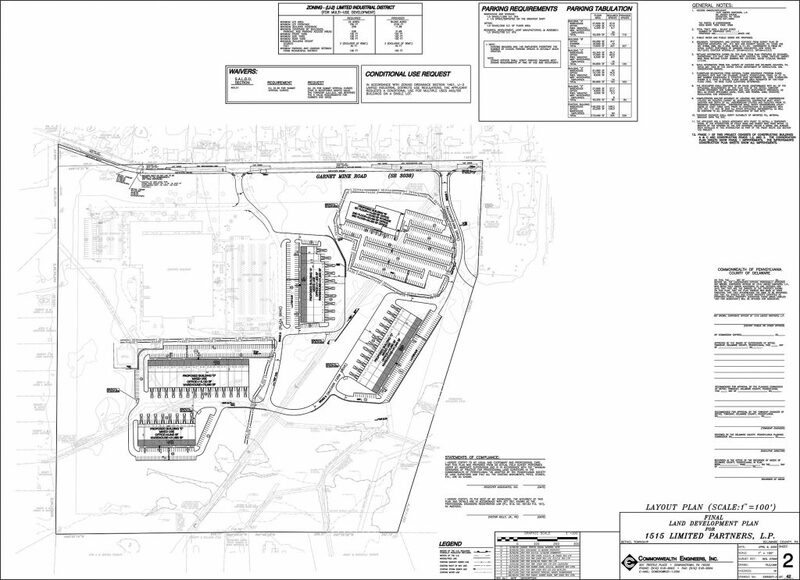 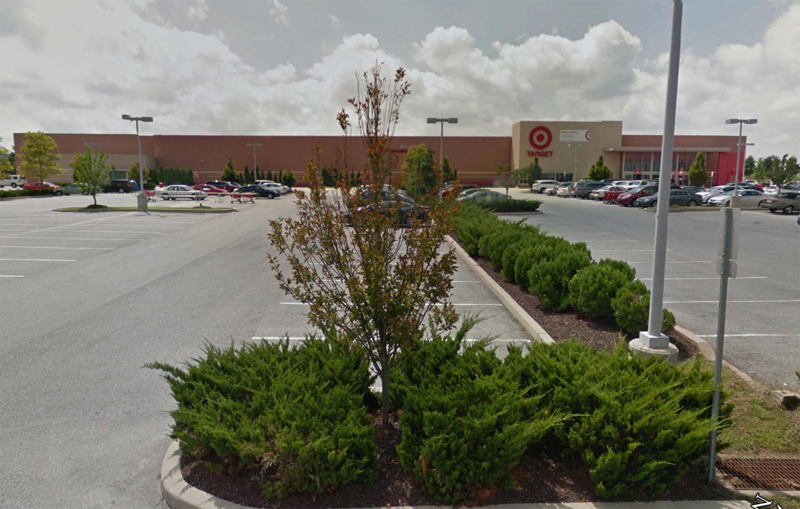 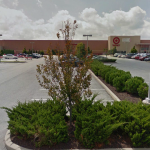 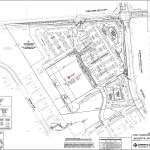 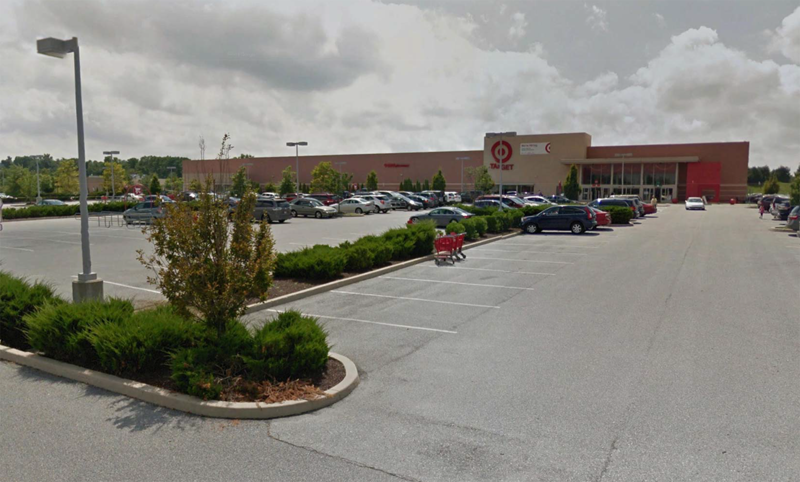 Commonwealth Engineers, Inc., completed the land development design for the Target Store located in the Eagleview development in Uwchlan Township, Chester County, Pennsylvania. 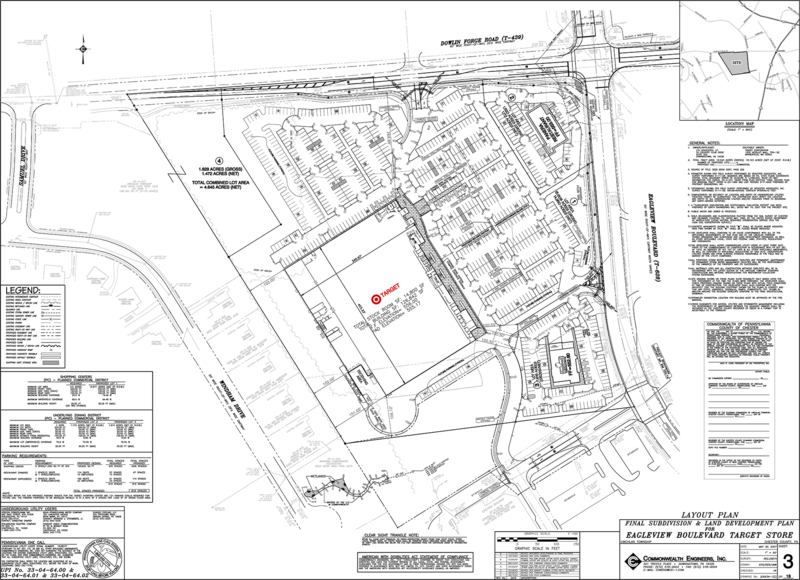 Commonwealth Engineers represented Target in all phases of development and worked closely with Target headquarters in Minneapolis, Minnesota. 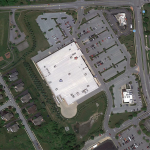 The project involved construction of a large Target store with all the necessary infrastructure including parking and underground stormwater management. 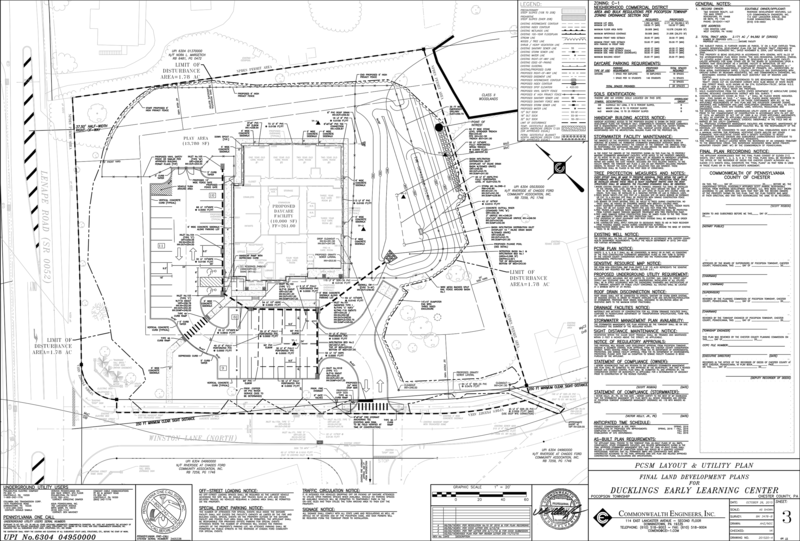 Commonwealth Engineers successfully secured all required Local, County, and State permitting. 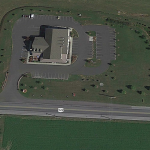 Commonwealth Engineers, Inc., performed comprehensive civil engineering services for September Farm, a popular cheese maker, sandwich shop and country grocery in Honey Brook Township, Chester County, Pennsylvania that was voted 2012 Chester County Farm of the Year. 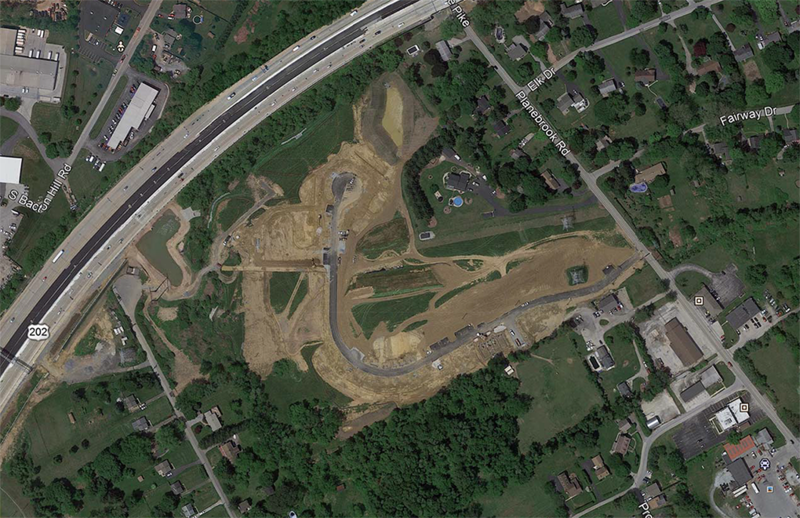 The project was located in a specially- protected High Quality watershed. Commonwealth Engineers successfully secured all required Local, County, and State permitting. 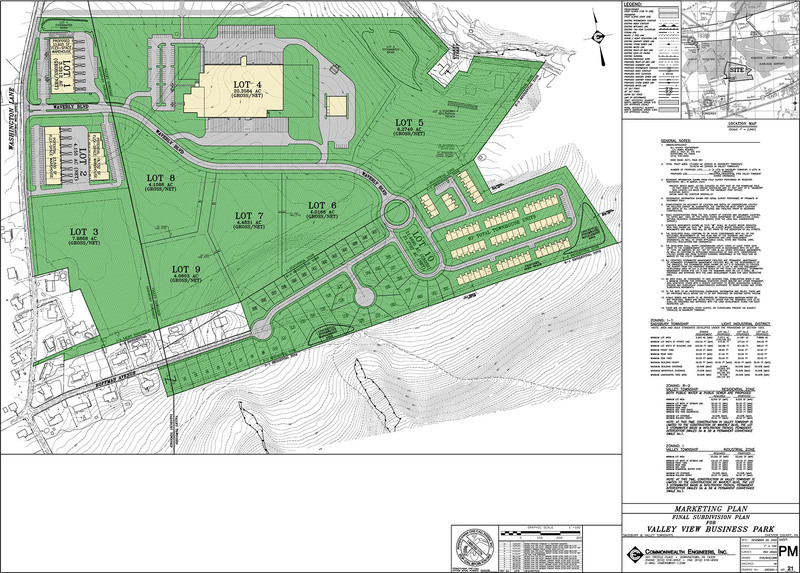 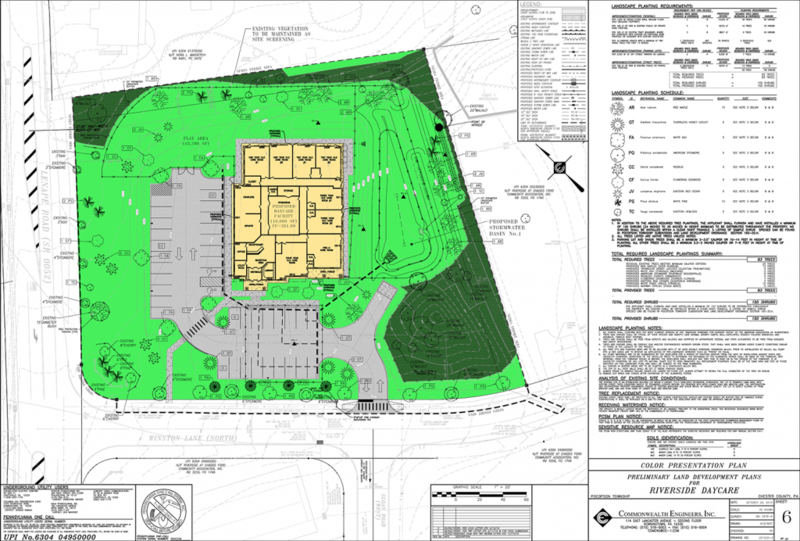 Keystone Foods Valley Township, Chester County, PA Commonwealth Engineers, Inc., was prepared the land development plans for Keystone Foods, a 200,000 square foot regional distribution center for McDonald’s restaurants with offices, warehouse space, and large cold-storage areas on a 20 acre parcel of ground within the Valley View Business Park. 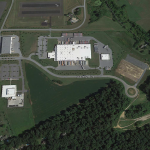 As part of the project, we also worked with the Federal Aviation Administration (FAA) to comply with Federal standards applying to the adjacent Chester County Airport. 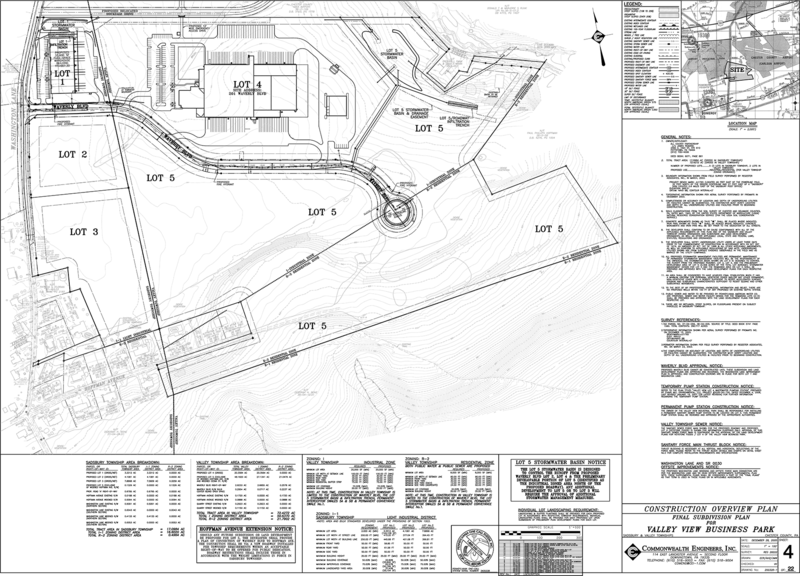 Commonwealth Engineers successfully secured all required Local, County, and State permitting. 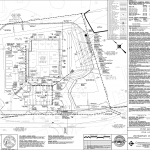 Hoover Building Specialists Honey Brook Township, Chester County, PA Commonwealth Engineers, Inc., recently obtained approval for Hoover Building Specialists, LLC, for a project that involved construction of a retail shopping center anchored by Honey Brook Hardware. 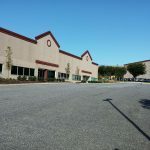 The project also included construction of the headquarters of Hoover Building Specialists, a leader in the building industry in southeastern Pennsylvania. 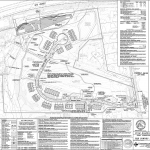 In addition to the building site, Commonwealth Engineers obtained approval from the Pennsylvania Department of Transportation for widening of State Route 322 and construction of a center turn lane to serve this development and surrounding businesses. 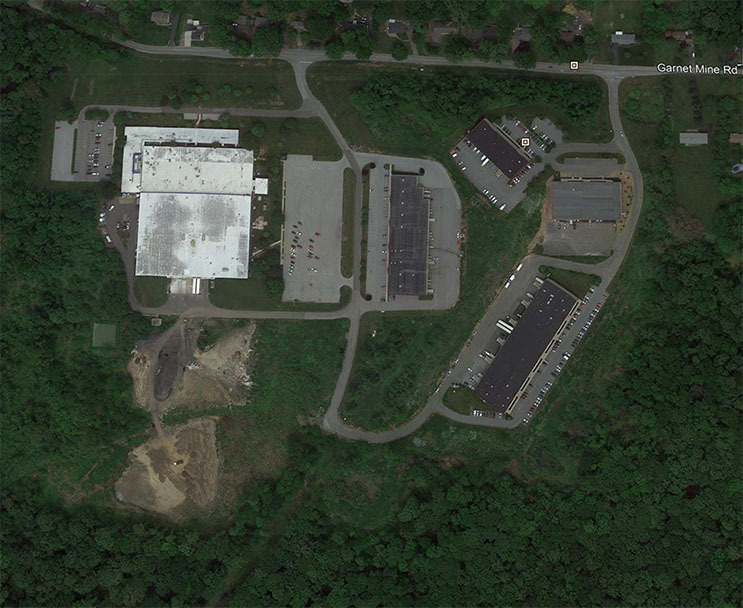 The project was located in a specially-protected High Quality watershed. 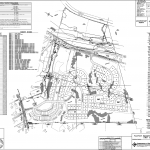 Commonwealth Engineers successfully secured all required Local, County, and State permitting. 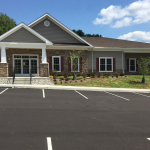 Ducklings Early Learning Center Pocopson Township, Chester County, PA Commonwealth Engineers, Inc., recently completed a design for Duckling Early Learning Center in Pocopson Township, Chester County, Pennsylvania, that will provide early education and daycare services to area residents. 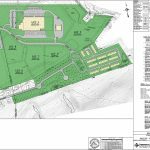 In addition to the standard land development and NPDES approvals, the project required Conditional Use approval from the Township. 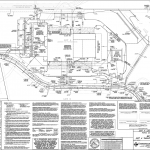 Commonwealth Engineers successfully secured all required Local, County, and State permitting. 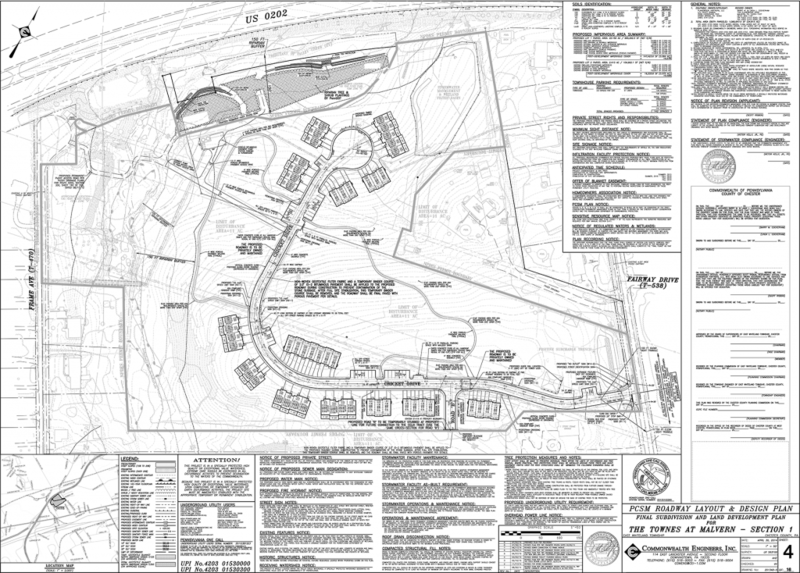 The Reserve at Chestnut Ridge West Bradford Township, Chester County, PA Commonwealth Engineers, Inc., provided the complete civil design for the Reserve at Chestnut Ridge another Toll Brothers project, a seventy-five acre project that contained thirty-seven single-family homes and protected open space in busy West Bradford Township, Chester County, PA. 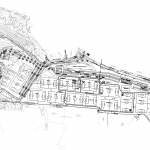 The project was located in a specially-protected High Quality watershed. 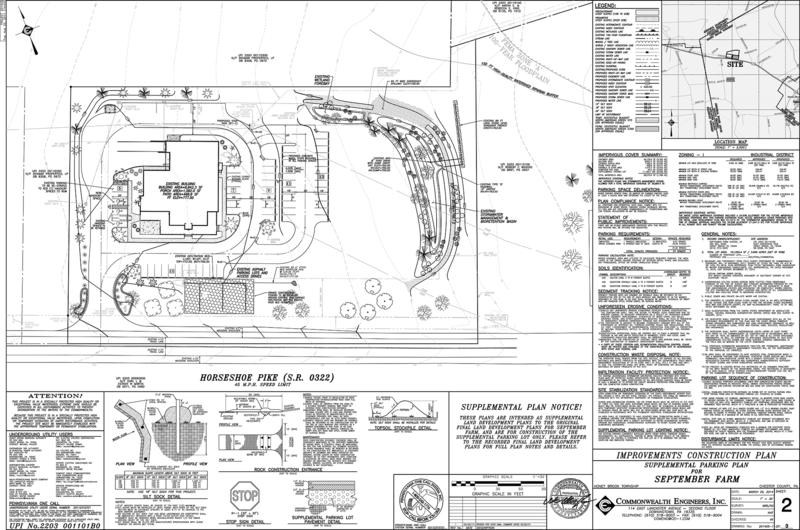 Commonwealth Engineers successfully secured all required Local, County, and State permitting. Commonwealth Engineers, Inc., obtained approval for Cedar Craft, an industrial manufacturing facility spread across three Townships in two different Counties. 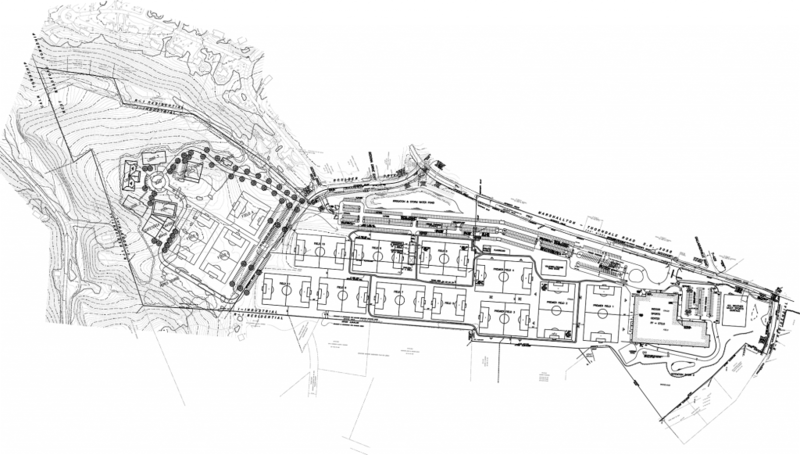 The project involved a long, steep access drive to the manufacturing facility, parking and storage areas, and innovative stormwater management. 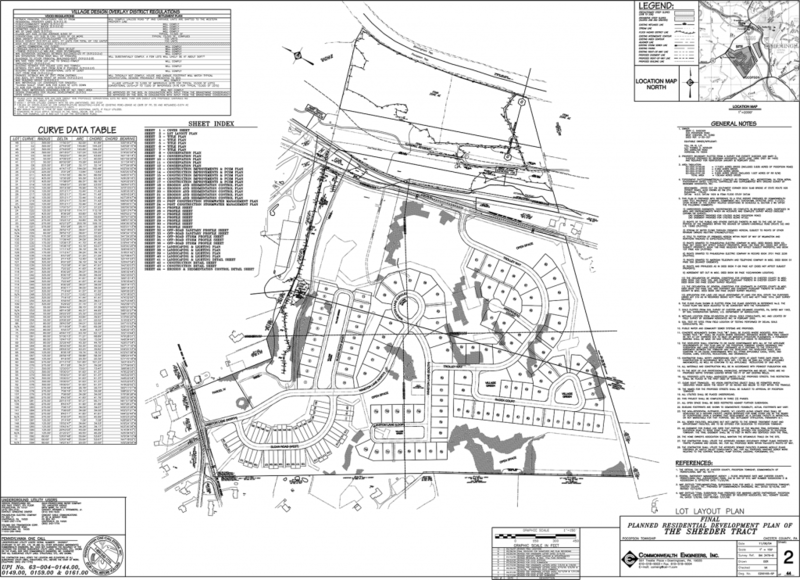 Commonwealth Engineers successfully secured all required Local, County, and State permitting. 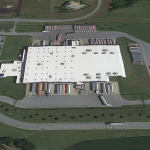 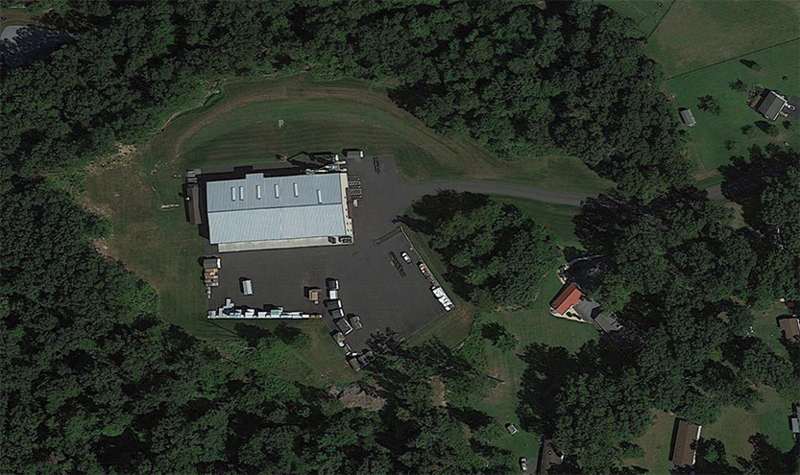 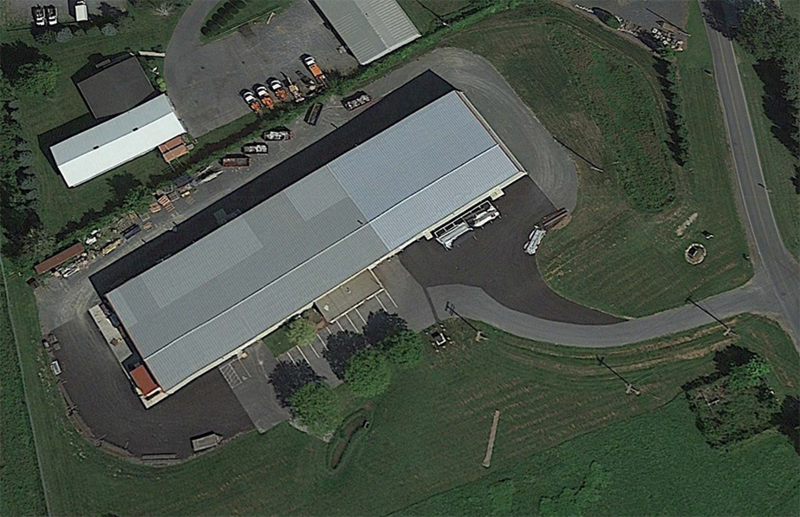 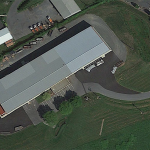 Commonwealth Engineers, Inc. was responsible for two industrial additions to the existing facilities of BenCo Technology, a precision laser cutting and metal fabrication company in Ontelaunee Township, Berks County, Pennsylvania. 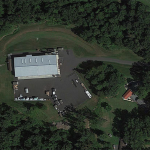 Commonwealth Engineers worked closely with the client, local authorities, and the Department of Environmental Protection and successfully secured all required Local and State Permitting. 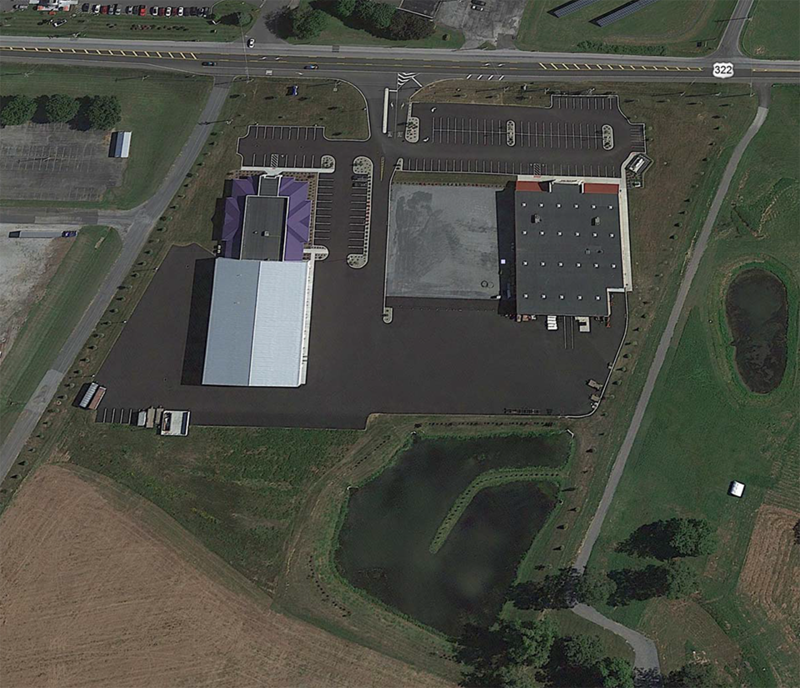 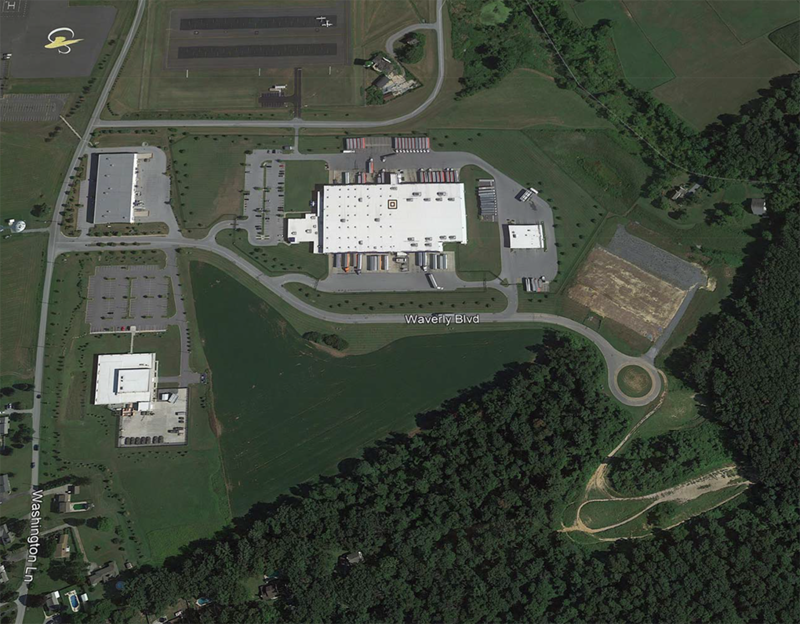 Commonwealth Engineers, Inc., was responsible for the preparation of an eighty-four (84) acre industrial park in Bethel Township, Delaware County. 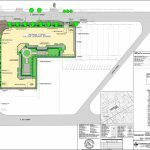 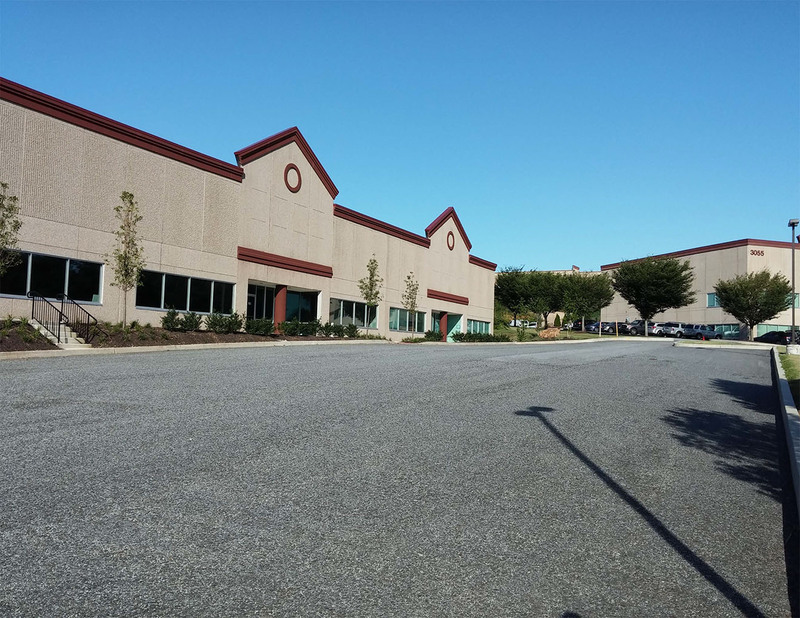 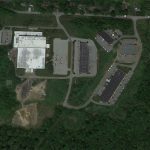 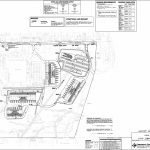 The project included one existing 181,200 SF industrial building and five (5) proposed new buildings that added a total of 221,820 SF of industrial floor space with expansive parking and infrastructure facilities. 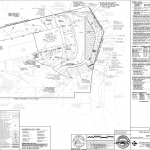 The project also required an NPDES Permit and special permitting for crossing several small tributaries located within the project boundaries. 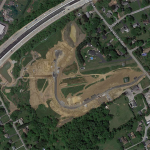 In addition, Commonwealth Engineers worked with the Buckeye Pipeline Company to protect two large high-pressure gas mains that bisect the site. 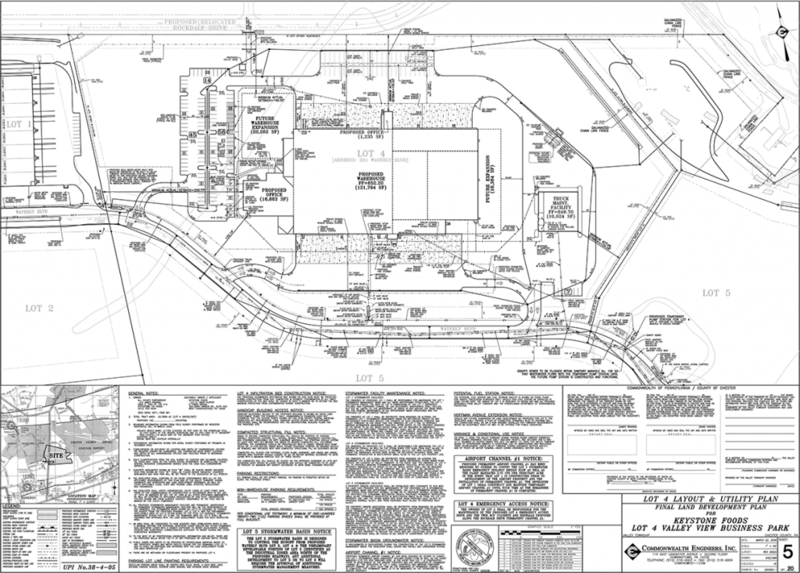 Commonwealth Engineers successfully secured all required Local, County, and State permitting. 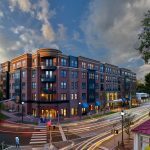 Commonwealth Engineers, Inc. was the land development engineer for Chestnut Square, located at 220 Chestnut Street in the heart of West Chester, Pennsylvania. 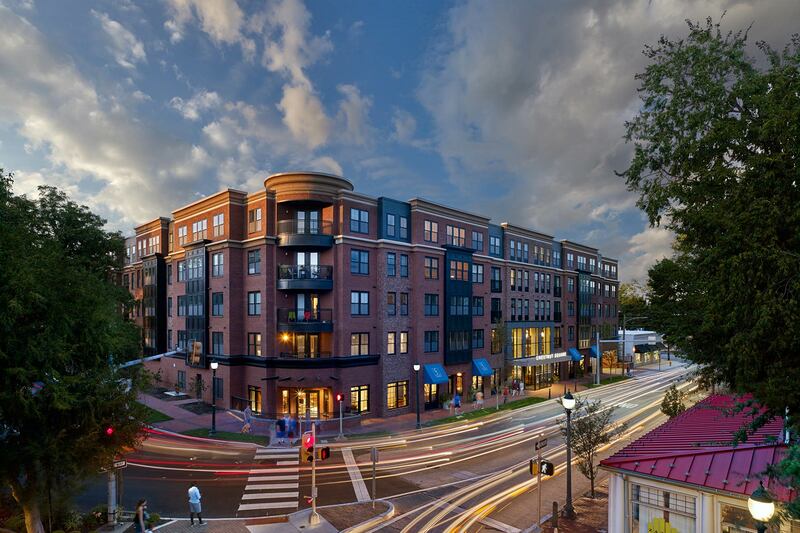 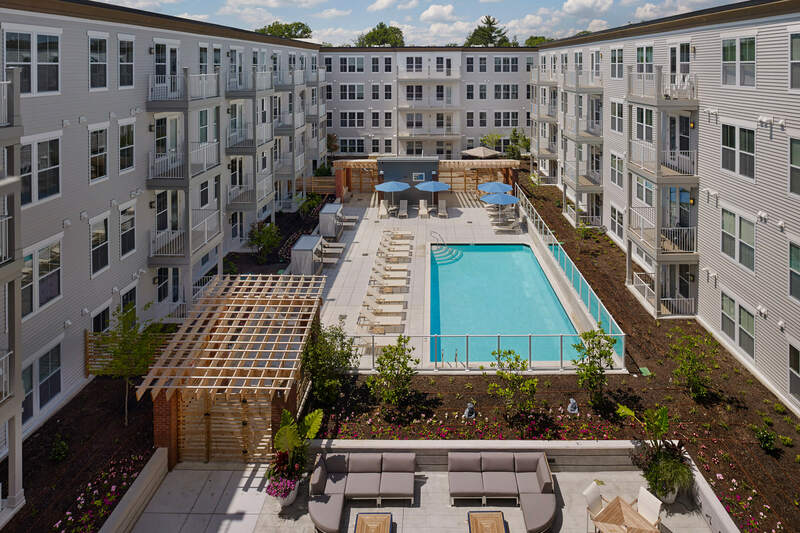 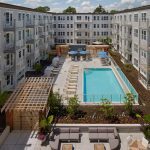 This development was a five-story mixed-use apartment building with 206 luxury apartments, street level commercial space, a rooftop green space and pool, and an interior parking garage. 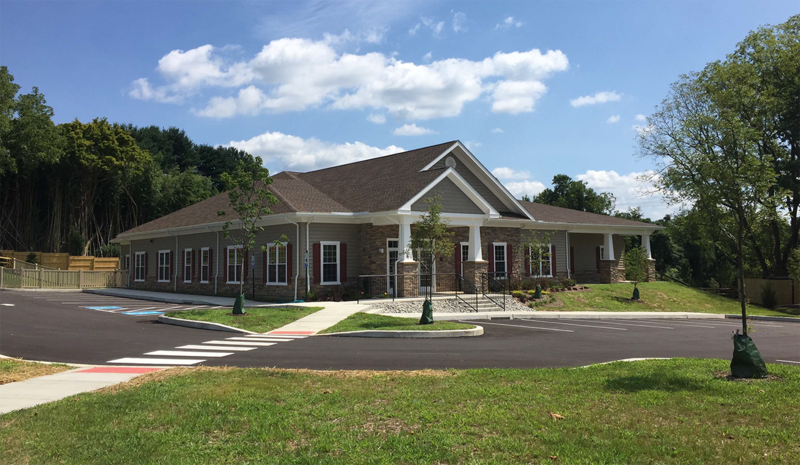 Commonwealth Engineers worked closely with the client, local authorities, the Pennsylvania Department of Environmental Protection, and the Pennsylvania Department of Transportation to successfully secure all required Local and State Permitting for this landmark building. 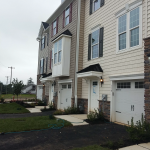 Providing redevelopment opportunities in the Borough required some innovations, such as green roof areas that were connected to roof drains and amended soils in the green roof areas, which satisfied all NPDES requirements.